It is one thing to discover your own truth, and it is quite another to declare it to the world. Those who appear in this issue of Inquiring Mind have proclaimed their deepest truth, facing the possibility of being criticized, ostracized or even tortured to death. In conversations with Orville Schell and Jerry Brown, the Dalai Lama speaks with simplicity of his convictions and, without a hint of blame, of the suffering of his people. In our interviews, Thich Nhat Hanh and Tsoknyi Rinpoche each express determination to teach their deepest spiritual understanding, even when challenged to take more politically explicit stands on current issues. In another brave statement, Alan Senauke and others write an open letter urging teachers and sangha members to address the plight of the broader world in their dharma talks and practice. Burmese freedom fighter U Tin U, in dialogue with Alan Clements, inspires us with his conversion through prison dharma practice from a man of war to a warrior for peace. Dramatizing the amazing strength of his character as well as the power of Buddhist meditation practice, he holds to his truth in the face of torture. Revealing one’s most intimate secrets also demands courage and allows profound transformation, as Caitriona Reed shows us by “coming out whole.” In Nina Wise’s story “Does the Buddha Have Breasts”? a group of women try to find a voice and an inspirational image that matches their own. Sandy Boucher writes warm reflections on the life and work of recently deceased Theravada teacher Ayya Khema. Ronna Kabatznick writes about the “zen” of eating and how we might transform our own longing for nourishment through generosity to others, the ultimate nourishment. Lama Surya Das offers thoughts and anecdotes on doubt and faith in our practice column. On our poetry pages we featured poems arising from retreat and meditative practice: Sam Hamill’s new translations of haiku by Issa and excerpts from a long poem by Peter Dale Scott. We hope that the stories, poems and declarations in this issue will inspire us all to live and speak from our own truth and convictions. Edward Espe Brown is a Soto Zen Buddhist priest and author. 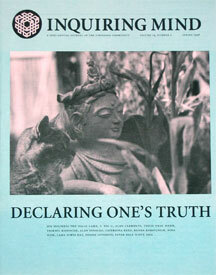 His photo "Two Awakened Hearts View the World" was taken in his and Patricia Sullivan's garden in Inverness, California, and featured their neighbor's cat Simba in repose with Patricia Sullivan's sculpture of Kuan Yin. Patricia Sullivan has made sculptures in clay and bronze since 1982; these sculptures reveal her continuing fascination with what it is to be an embodied soul on earth. She teaches yoga and lives in Fairfax, California.